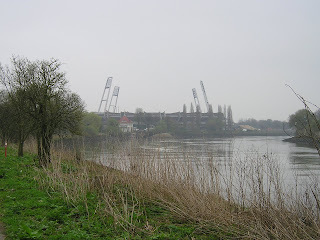 Weserstadion - home to Werder Bremen. No goals so let's take a snap. Danny (left) and Nick. 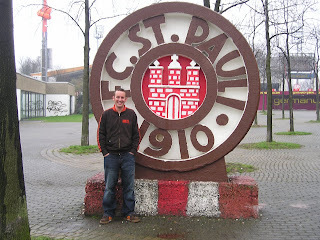 St Pauli - The Rebels Choice. Evidentially 'football fans are not criminals'. Football + beer = Danny (left) and Nick in silly photo shock. You just knew this was going to be a good weekend when upon unveiling my curtains in the morning I realised our hotel was overlooking the Millerntor Stadion - home to the Rebels Choice - St Pauli FC. Anyone who has ever spent a night or two in the Jolly Roger pub in the St Pauli district of Hamburg will remember it and that's for sure. It's a dream place for drinking, singing, talking football, politics and general wibble. St Pauli weren't at home that weekend so we headed to their hated neighbours Hamburg with 57,000 others for their game with Bayer Levekusen. Aside from Borussia Dortmund - who I have a liking for due to their fans who have always been brilliant to us - I can switch my German football allegiance at the drop of a hat. 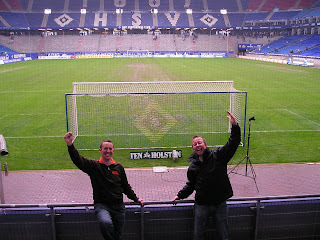 Nick and I made it our mission to get into every side of the ground at Hamburg and we achieved this with surprising ease. 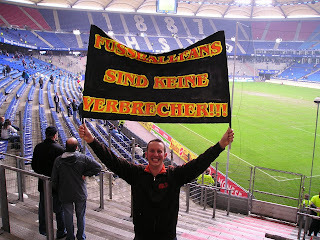 As Bayer Leverkusen (complete with young Dimitur Berbatov) were winning 2-0 we decided to end up in with the away fans. Ten minutes before the end of the game we were in with them and as usual we ended up celebrating as if we'd won the world cup. 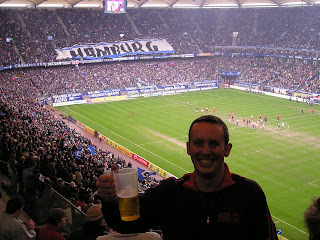 Hamburg is a helluva place to go drinking and by the end of the evening we were singing and dancing with a group of Leverkusen fans who gave us their scarves at the end of a memorable night. 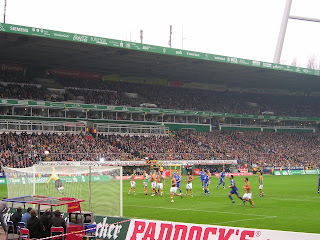 Complete with enormous hangovers we got the train down to Bremen the next day for their game with Schalke 04. Bremen is a very nice city and home to the Becks brewery - don't mind if I do - cheers! We decided to walk along the river to the stadium and stop for a few beers en route. 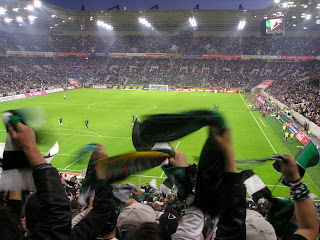 Thank the lord that Bremen had magnificent floodlights to marvel at which eased the pain of watching a dull 0-0 draw. Post match we stocked up on Becks for the train back to Hamburg - talked an enormous amount of irreverant rubbish, interspersed with fits of the beer giggles and headed back to the Jolly Roger to finish ourselves off. Another European Football Weekend with no bother - tick. 6 pints + comedy jacket = much amusement. Commerzbank Arena - home to Eintracht Frankfurt. 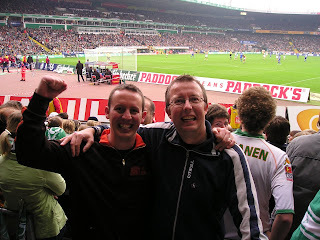 Another trip where we used Cologne as a base and purchased a 'weekender' train ticket to go to our games. These tickets allow up to five people to travel on regional trains throughout Germany for the princely sum of a couple of buttons. After a Friday night of drinking in our favourite pubs of Cologne we ventured down to Frankfurt and met up with some home fans in the bars set up outside the stadium. From what I remember one chap had a Kermit the Frog around his neck which was infamous in those parts. We had tickets for the seating section of the stadium but the lads we met were having none of that and they sneaked us in the terracing behind the goal in with the ultras. 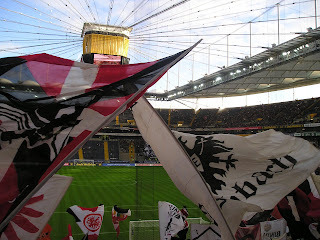 The stadium was barely half full but Eintracht Frankfurt fans are known for their vociferous support and they didn't disappoint. After the final whistle everybody celebrated as if they'd won the world cup. Who were we to argue!? 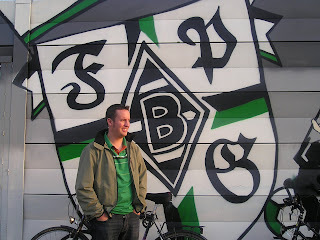 The next day we headed for a pre-arranged meet with Thomas 'Tower' Weinmann in the Borussia Monchengladbach fanhouse near to the stadium. Tower is the fan liason chap for BMG and he does a great job. It'll take you a nano-second to realise why he called Tower should you ever cross paths with him. The hospitality afforded to us in that fanhouse before the game was legendary. A few weeks after that game Tower sent me a package of BMG goodies including badges, cds, pennants and allsorts. There wasn't a dry eye in the house back here at European Football Weekend HQ. Stumbling out of the fanhouse and into the stadium, some of the fans told us that BMG were famous for having fans with denim jackets and football patches on (what's not to like!?) and huge tumbling surges on the terrace when BMG score. We were on the terrace which only cost us £8 each which made up for the fact the game finished 0-0 and hence no aforementioned tumbling surges. Operation 'on the pitch' a success! The welcoming sign on the pub door in the stadium (see below for details). You are left in no doubt whatsoever as you pound the streets of Split in Croatia as to who rules the roost in the City. Named after fan groups that originated in Brazil the 'Torcida' are the Hadjuk Split ultras and boy don't they like to let people know about it. The City is awash with graffiti and murals emblazoned with the Torcida motifs coupled with the badge of Hajduk Split. 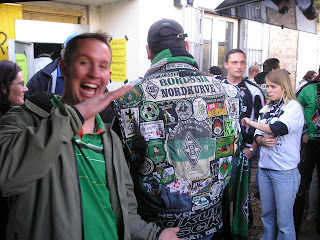 The group were formed in 1950 and are thought to be the first ultras of their kind in Europe. I always bang on about ultras, so for those who aren't sure (hello Mum) - loosely speaking, the supposition of the 'ultra' is that the behaviour of the fans present in the stadium could help the team gather strength to beat the opponent. Outside the railway station in Split there were lots of stalls selling Hajduk Split & Torcida merchandise along with an alarming amount of knives. Whilst browsing these stalls I saw more knives being sold than scarves. When I enquired as to why this might be, I was informed that it was because Dinamo Zagreb were in town the following day - fairly do's. Hajduk Split v Dinamo Zagreb is probably the biggest game you can attend in Croatia. The game was taking place on Saturday evening. I was there in Split with my wife and like a lemon I had booked us on a ferry to Dubrovnik and so sadly I wouldn't be seeing the match. Insert expletive of your choosing at this juncture - I did. One of the best things in life is to see a game of European football. If that's not possible then the next best thing to do is go to the ground anyway and engage in a little operation I like to call 'Let's see if I can get on the pitch'. Previously on these pages you may have read how my friend Nick and I had the keys to Stirling Albion's ground and we helped ourselves to a glorious 30 minutes of larking about doing pretty much as we pleased. Equally you may have read how my wife and I had our lunch sitting pitch side at the ONO Estadi - home to Real Mallorca. It can be done and I for one love absolutely love it. So there I was strolling confidentially up Split High Street having dispatched a couple of local lagers down the hatch when I came across a stall. Behind said stall stood around 20 of the meatiest blokes you'll likely to come across on a sunny afternoon in Split. It could only be the Torcida. If Danny Dyer had been there - I've no doubt his flapper would have been going. I approached them and started chatting. This obviously could have gone one of two ways. Luckily my opening pundit of expressing my disgust for all things Dinamo Zagreb (I don't really care) went down a storm. I was embraced with open arms and before I knew it - they'd stamped a 'Torcida' motif on my arm and dished out a few of their ultras badges - nice. They pointed me in the direction of the stadium and with that I was off, confident that it would only be a matter of minutes before operation 'get me on the pitch' could be declared a roaring success. The Poljud Stadium is only a 10 minute walk from the centre of Split. The area surrounding the stadium is *cough* really...erm...different to the tourist route. Upon my arrival to the ground I was pulled aside by two stewards and was asked what I was doing!? I forgot to tell them I was on a mission to get on the pitch and asked them where the club shop was. Having safely negotiated my way past those stewards, I continued on my walk around the outside of the stadium. Then two police cars pulled up along side me and called me over. They told me I should leave as they wanted nobody around due to security issues surrounding the match with Dinamo. It wasn't looking good. They then drove off and so I thought - well I've come this far. I then came across a magic door which was open but blocked by two more security guards. This was my chance. Thinking quickly I flashed my 'Torcida' stamp on my arm to the guards and within a flash I was through the magic door - and into a garage - well it's a start. Quite what a garage is doing underneath the main stand at Hajduk is anyone's guess but there I was. Three enormous Croat mechanics stood over me as I entered the garage. They didn't speak English and pointed me in the direction of a bar. On the door of the bar was a sign that you can see in the picture above warning me not to take any guns into it. Luckily for me I'd left my weapons back at the apartment so this wasn't going to be an issue. Upon entering the bar I could see the pitch through the window. I asked the barman if I could go into the stadium. I couldn't help but flash my Torcida stamp on my arm to him whilst doing so. A big smile broke out across his face, out came some keys and through I jolly well went - and relax. I didn't quite have the stadium to myself. There were a couple of athletes running around the track surrounding the pitch. I hate running tracks around pitches in football grounds but there I was running around one trying to stop a chap to get him to take a photo. He obliged without batting an eyelid. In fact he said "Do you want to stand on the pitch to do the photo!?" Mission complete! Not quite the pleasure of seeing a game but a littlest Hobo type adventure to tell the wife over a nice cold beer back in Split. The rest of our weekend was a complete joy. We took an 8 hour ferry down the Adriatic Coast to Dubrovnik which is the best way to go. The scenery was simply stunning and the islands you pass on the way couldn't have looked more beautiful. We stayed in Dubrovnik for two more days and I barely gave the fact that I'd missed the match another thought*. I had a look at the papers the next day. Hajduk Split 1-1 Dinamo Zagreb. A crowd of 10,000 saw the match. If you think that crowd was bad - the other matches in the Croatian Premiership attracted crowds of less than 1000. That didn't stop them knocking England out of Euro 2008 though did it!? I've looked through some footage of You Tube from the match. Needless to say it looked brilliant. Signal rockets, flares and other fire materials being set off by both sets of fans during the whole game. I'll be back.